Note: This post applies to Canada and the United States. I don’t know about the rest of the world. I have signed a lease on a brand new car yesterday (note: the brand is not Toyota), I thought I was getting a pretty good deal on the car. However, when I got home, I noticed that the salesman has played with the deal to make it better, while, in reality, it was the same. In short, what he did was that he gave me a $2,000 discount but increased the rate by 2%. I ended up getting a deal worse than the one that they offer to just any customer. That, of course, made me a bit angry, so I went back to the dealership and I explained my frustration. The executives were sympathetic but they were clear in pointing out that I can just choose not to have the $2,000 discount and have the lower interest rate, or have the $2,000 discount and have the higher interest rate. They offered me some perks on top of my purchase, but not enough, I wanted at least to have the discount and the lower interest rate. Eventually, the dealership manager sat with me, and told me that they offered me the best that they can, and, if I’m not in agreement with the lease rate as it stands, then they can’t do anything about it, and all that they can do is to refund me my security deposit and break the lease. That’s what I did, but it was done in a very friendly and professional way, which made me want to buy from them again (the same dealership) when their interest rate goes lower. So, if you just signed the lease on a new car and did not have your car delivered yet, and if you want to break the lease, then the car dealership will have no problem doing that for you. I’ll be a totally different story though the second you drive that car out of the dealership garage. At that moment, your only option will be to find another sucker who will buy your lease. If you’re shopping for a car, then I’m sure that the first thing you’ll notice is that car companies try their best to get you on a lease contract. You can clearly notice, from their conversation, that they would rather prefer if you lease the car rather than just finance it, and they don’t do that because they’re idiots. In fact, it’s the complete opposite. He immediately responded, it’s because when you’re leasing a car, we will have the chance to see you in a few years when you are returning the car, and we can sell you something else. But, if you’re buying a car (especially a Toyota), then we will not see you for a long, long time, and because we won’t have the chance to see you, then maybe you will be tempted to buy from a different car maker. That’s their logic. They’re willing to sacrifice short term profitability for a long term business partnership. That’s not a bad logic, at least from my perspective. So, the next time you have a choice between a lease or a finance, then pick the lease, it’ll be cheaper for you (a few hundred dollars over a 5 year term), it’ll be more convenient, and you will only be committed when you decide to buy the car at the end of your lease. If you own IBM stocks (NYSE:IBM), you must have noticed that the stock is down so far 1.23% this year, while the aggregate index of technology stocks went up 1.1% during the same period. You might not think that this is huge, but it is, since IBM has been one of the most consistent and profitable stocks for a long time. I’ve even recommended it here and claimed it’s one of those stocks that you should hold forever (well, until you need the money anyway). Not anymore. Its services are becoming increasingly costly to the client. I will explain later why. Its full time staff mostly consists of incompetent backstabbing employees whose major focus is to protect their jobs by playing vicious politics games, while its consultant staff consists of costly mercenaries who’d sell their souls to another company the second they are offered a few dollars more on top of their hourly rate with IBM. Let me first discuss the first point. I know quite a few IBM employees (full time and consultants), and all of them tell me how stupid the whole IBM consultancy business has become. For example, one of the projects a friend of mine worked on was to move a few hundred PCs from one building to another (just so you know, the buildings were almost connected to each other). My friend told me that IBM charged the client a ridicilous amount of money (think $100k+) just so that they can produce a project plan to move those computers. I then asked my friend, isn’t the whole thing about calling a moving company and asking them to to move the computers from one building to the next, while ensuring that the new building has full Internet coverage? The answer was yes. The resource’s basic rate is $100/hour. The consultant invoices the recruiter $100 + taxes (about $115/hour). IBM charges the client $160 + taxes (about $184/hour). So, you see, IBM made a raw profit of $30/hour for that particular resource even after billing the client in the near of $200/hour for that consultant for creating a stupid plan to move PCs from one building to another. In other words, they overcharged the client but they didn’t make some serious money, which means, sooner or later, they’ll raise the prices and bill the client even more money! If you have a very faint idea of what IBM is, you will know that $30/hour as a raw profit will not even cover its bills. The question is, when will those companies that deal with IBM notice that they are paying a lot more for services that should cost much less. IBM has become, unfortunately, one of the worst large companies in the world when it comes to resource competence. The thing is, IBM makes the most of its revenue from services rendered to other companies (and not from products), and that’s why resource competence is not that important. In fact, the less competent the resource is, the better he is for the company because a task that would otherwise take 100 hours will take 500 hours (and the client, of course, will be billed for 500 hours). Now, since IBM’s staff is not that competent, then, it is very normal that office politics become a major game that everyone plays to protect his job. Every single resource at IBM is aware that he or she is replaceable (because he or she is incompetent), and that’s why they fight so hard any attempt by a workmate to step into their territory. This politics game is very stressful, and leads to significant loss in productivity. All the above applies for the consultants as well, except, of course, that consultants couldn’t care less about IBM’s future, and have no problem biting the hands that feeds them the moment they get paid enough to do it. The strategy that IBM follows by hiring many super-expensive and incompetent consultants is very questionable: it hurts IBM and it hurts its clients. I have no idea why they do this. The reason why IBM is kept afloat is because of its reputation, and because there is no alternative for many companies already using IBM (large companies do not want to take the risk of changing their major vendors, plus, executive at large companies have usually close relationships with IBM’s executives). There is too much cleaning that needs to be done at IBM before it regains a sustainable business status, and all that cleaning should start, in my opinion, with the staff and those who are overseeing the staff. If that’s not done, I’m not sure if IBM will still be there 10 years from now. Until IBM proves that it’s on the right track again, maybe you should reconsider your decision to keep those IBM stocks that you bought 10 years ago. A customer care representative yelling at a client, in front of other clients, in a mobile shop. A programmer minimizing the blue Facebook window when a manager passes by. A programmer who doesn’t even test his own code, claiming that his job doesn’t include any testing. A designer working freelance for a client while on full-time payroll for another company. A bus driver who stops working before his shift is over. An employee publicly bashing his company on social media, and then getting support and attention from his ilk when he eventually gets fired. A construction worker trying to work as slowly as possible so as to get paid much more while working much less. A janitor who’s not at his desk most of the time. An employee calling in sick for 3 days in a row while vacationing somewhere sunny. A doctor asserting that the aforementioned employee was indeed sick. A doctor prescribing specific drugs, not because they’re effective, but because he was paid by a pharmaceutical company to do so. An employee applying for other jobs during working hours. An employee taking a very long lunch break so that he can go to job interviews. A project manager deliberately hiding the real status of the project from his stakeholders because, by the time all the mess is revealed, he’s sure he’ll be working for another company. An employee who literally does nothing the whole day (there are many people like this and they are very abundant in large companies). A plumber who doesn’t fix the problem but claims he did. A postman who claims that he tried to deliver a parcel but didn’t find anyone in the house, when he didn’t even go to the house in the first place. A woman hiding the fact that she’s 3 month pregnant before applying for a job, and then, 6 months in, taking a 1 year paid vacation to raise her child, then returning to work, and repeating the whole process again within 6 months. A lawyer working against the best interest of his client. A salesperson (who doesn’t get any commission) whatsapping while you’re wondering around the store seeking help. A salesperson (who gets commission) completely ignoring clients whose sales might not generate a commission worth his time. I can think of many other examples that I’ve seen, in real life, and I’m sure that many of you have seen as well. My question is, what happened? Why is it, that all of a sudden, nobody cares about work ethics? Why is that nobody believes that pretending to work is equivalent to stealing? When I was at school, the teachers used to tell us, those of you who don’t study are thieves; they steal their parents’ money. I believed that then and I believe it now. In this day and age, I don’t believe that many people think the same way anymore. What happened for the whole world to reach new lows every day when it comes to work ethics? People think that they are entitled for better jobs. I have no idea what’s the cause of this symptom. People think that the world owes them something (while, in reality, it’s the other way around for most people). Many families right now are broken. Families are the essence of everything good in one’s heart and mind, once broken, all that good is no more. A broken family means broken ethics. Governments, especially in the Western hemisphere, provide too much benefits for those who do not work. Management is becoming more and more meaner. Corporate culture has changed from retaining the best employees to making the most profit. There are still some companies that are not like that, but they’re not a lot and they’re quickly getting eradicated. There’s just too many distractions nowadays. A few decades ago, the only distraction was the TV, and there were no TVs at work. Nowadays, we have phones, smartphones, tablets, laptops, video games. There are just too many ways to waste one’s life on unproductive (yet fun things), instead of focusing on what’s important. There is zero corporate ethic. We currently live in an age where a company sees no problem of stealing a resource working for another company, which results in resources having zero loyalty to their previous and their current company. Most people are working in jobs they don’t like. I guess that relates to the whole education system, where one is suddenly cornered to make a career choice prior to going to the university, and eventually making the wrong decision. The education system has changed from non-profit to for-profit some time ago. Of course, in the eyes of every single government in the world, it is still non-profit. This has resulted in a workforce with a much lower dexterity. Schools no longer promote good ethics and obscene behavior is becoming more prominent/acceptable at schools. Teachers used to hit us on the slightest mistake, now, if a child is morally injured, it is a big scandal and the teacher will get fired. Most companies nowadays take Mickey Mouse certifications into consideration when hiring a candidate. I a firm believer that certifications amount to nothing without being supported by a solid work experience. In fact, the work experience is what really matters. Too much pampering in the present, and not a single guarantee for the future. Many companies nowadays pamper their employees too much and give them too much leeway (e.g. allowing them to work from home, having a daycare/playroom/free cafeteria in-house, giving long vacations, etc…), but these same companies do not guarantee the future of their employees. Most employees wonder: “What happens when I’m 50, will they replace me with someone younger? Or will they let me do my job until I can’t do it anymore?” Companies never address these concerns because they’re sure that they are going to replace those employees (with the exception of the elite few). The abuse of anti-discrimination laws. Nowadays, if an employee is slightly reprimanded, then he’ll make up stories that s/he was singled out because s/he was of a certain gender, or a certain ethnicity, or a certain religion. This has resulted in a toxic environment, where everyone has to be politically correct, at the risk of getting sued. This has also resulted in a state where these bad employees control the show (or at least have a say over management). The concept of startups. I received an email a couple of days ago from a “friend” that stated that she, and her husband, were planning a startup and that they’re amassing money. She wasn’t the least subtle about the fact that the ultimate goal of this startup is to sell it to a Google or a Microsoft, amass the money, and laugh all the way to the bank. She wanted $250,000 to fund her stupid startup, and that $250,000 constituted about 5% of the total shares in her (again, stupid) company. Pardon me, but I believe this is a scam, and when you’re working for a scammy company, you really are not required to have any work ethics (unless, of course, you don’t know who you’re working for, which makes you a big sucker). The concept of outsourcing. Outsourcing is, by far, the worst concept devised in the business world. It does create the illusion of increased profitability, but what it really does is disengaging employees and reducing their loyalty. Why should an employee be loyal to a company that is willing to replace him with another, cheaper resource located thousands of miles away if it had the chance? I can think of many other reasons of why work ethics are at an all time low, but I think I’ve made my point. The problem is that this phenomenon is affecting the quality of every single product/service we buy, so it should not and cannot continue. The question is, is there anything that can be done to right all this wrong? I have no idea. Physically picking a mail from a rural place in Canada. Of course, there’s a huge possibility that that mail is nothing more than a useless ad, but that’s a different story. Taking that mail to the central location that is nearest to the rural place. Flying to the most remote province in Canada – think Nunavut. Going to the most remote rural area in Nunavut when it’s -50 degrees outside (excluding windchill). Taking that mail and placing it in the mailbox of someone, or perhaps delivering that mail in person to that someone, at the risk of getting bitten by ferocious dogs who weren’t properly fed for days or getting shot by an angry lunatic. Returning home, which maybe somewhere near Cape Spear. If you can do all the above for 85 cents (CAD), then you should work for Canada Post, because they will do all this for 85 cents, and that’s after they raised their prices from 65 cents. This is not logical and it doesn’t make sense and it shouldn’t be this way. Maybe 85 cents was OK when there were only 5 places to Canada to deliver to (of course, assuming that these places were all in a 100 meter radius), but now, it just doesn’t make any sense. Nobody in their right mind should do the above for less than $500, and that’s after deducting the transportation. Of course, I’m not saying that Canada Post should do this for $500, because of the volume of mail they’re handling to and from any area, but I’m just saying that 85 cents is just too cheap. I think Canada post should at least quintuple their basic rates. In other words, it’ll be $5 (including taxes) to send a mail. This will ensure that we have less junk mail circulating (not everyone will be willing to pay $5 to send junk) and will increase the efficiency and ensure future profitability of the company (currently Canada Post is losing money). Unfortunately, I’m sure that the Canadian public will strongly oppose any such move, but, I have a question for those opposing such a substantial rate hike, would you be able to build a profitable mail company (if you had the money) that can deliver mail from Canada’s Southeast to Canada’s Northwest for 85 cents? Heck, would you be able to do it for $5? If you can’t, then please support this rate hike or keep your mouth shut when the government takes your tax money to support Canada Post, because that’s what will probably happen eventually. If you have ever tried doing a wire transfer from outside Canada to a Canadian bank, then you have probably smiled after reading the title of this post. It’s a weird experience that may or may not work from the first 5 tries, especially if you’re transferring money to a Canadian account in USD. Why is that? Well, because Canadian banks have this peculiar way of not using their own swift code for international transfers to a USD account, for some reason, they use the swift code of a bank in the states. For example, if you have a USD account in TD Canada Trust (which is one of the Big 5), then, if you request the wire transfer information to your own account, then they will give you the swift code of Bank of America. The Bank of Montreal (BMO) will give you the swift code of Wells Fargo. Now, since the swift code is not that of the Canadian bank (but that of a US bank), then this naturally means that the address of the bank, as well as your account number, are both different for the wire, and this is where the fun starts. Not a single person in any of the 2 banks I deal with has given me the right wire information so that I can give to my clients. I did have one client who tried 5 times to send me the wire, losing about $30 each time they tried to send it, and each time I was telling TD that the wire is not working, and they were sending me new information to send back to my client (I would have posted the hilarious email thread here if it didn’t contain some sensitive information about my TD account). Eventually, my client gave up and sent me a check. What’s even weirder about Canadian banks is that they don’t use the IBAN (International Bank Account Number) for wire transfers (check this thread if you want to know how confusing the decision not to use IBAN is to customers), which makes the whole process of sending money (especially from outside North America) to Canada a near-death experience. Thankfully, I haven’t tried it yet, but I’m sure it is, since banks outside North America will not even accept to send the wire if there is no IBAN. If you successfully wired some money from outside Canada to a USD account in Canada, then you should consider yourself a lucky man, since the process won’t work for most people. Oh, and by the way, don’t expect a lot of sensible help from your Canadian bank when it comes to wires. If you’re using PayPal, then you should know by now that they are, by far, the best payment processor out there, simply because their discount rate is very reasonable and you don’t need to pay merchant fees for their non-API model. Not only that, things get better the more you use PayPal, since the more money you get paid through PayPal, the less the discount rate is. For example, if you make more than $3,000 in monthly transactions (before applying their discount), then your discount rate will be something like 2.5% (down 0.4% from the basic discount rate), which is extremely reasonable. Now, will that happen automatically? In other words, will you get the new discount rate automatically once you pass the $3,000 threshold during a certain month? Unfortunately, no, you will need to call PayPal to get the new discount rate, and the new discount rate will only be applied as of the next month. For example, if you made $3,000 back in May, then you will get the new discount rate in June. Note that in this scenario, if you call them in June to get the new discount rate, then they will apply it immediately (however, it won’t be retroactive on the previous transactions that occurred in June). If you call them in May, then the new discount rate won’t be applied until June 1st. But, what if, in a certain month, you make less than $3,000 in sales through PayPal? Well, then you will go back to the 2.9% discount rate. However, once you make $3,000 in a certain month again, then the lower discount rate will be automatically applied in the month that follows, without you having to call PayPal again. What’s even nicer about PayPal, is that you will even get a better discount rate once you break the $10,000 and the $100,000 thresholds. You can check all the discount rates here. Note: If, after reading this post, you start getting ideas about buying some PayPal stock, then don’t. PayPal is a private company, and the bigwigs there are happy with the structure of the company, and they certainly do not need any additional money from outside. Try traveling from any airport in the world and you’ll feel like Alice in Wonderland after drinking the shrinking potion: everything is bigger at the airport, much bigger. You find huge TicTacs, Toblerones (I have no idea why Toblerones are very prominent at airports), M&Ms, Nutellas (we’re talking about 10 pound Nutella jar here) – everything. What’s weird is that it’s an airport, and you’re meant to fly after buying these huge things, and there is some serious space limitation (especially if you’re traveling coach/economy) when it comes to the things that you can take with you on board. Very odd. I mean, why on earth do Airport managers think that having a huge Nutella jar is a good sell at an airport I have no idea. Do they think that we’re still in the 70’s, where you have to worry about getting Nutella when traveling to many countries (of course, that’s assuming that you like Nutella in the first place despite the fact that it can harm your teeth). It’s really hard for anyone to find a logical explanation for this phenomenon (which is worldwide by the way), if anybody knows the reasoning behind this, then please share. 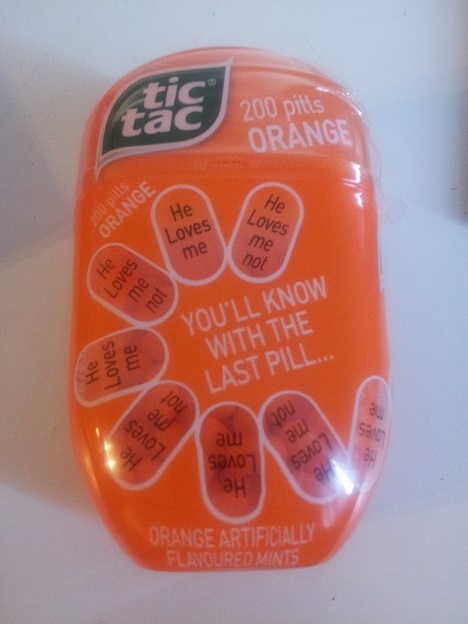 TicTac Orange – 200 Pills! Clearly, most Canadians pick price over quality any time! How I created this data: I compiled a lot of data programmatically (I’m a programmer as well) from different car websites, I then aggregated the data and retrieved the top 10 car makers. I then added a simple line of code to calculate the market share that each car maker has with respect to the top 10 car makers’ share. The number of public companies that are extremely overvalued and hyped is huge, but, it’s very rare to see a public company that hasn’t sold anything yet (and may never will) with a stock that’s up 450% (yes, that’s 4.5 folds) in one year. That company is Tesla Motors (NASDAQ:TSLA). When Tesla Motors was first coined as a concept, there was no real competitor, now nearly every car manufacturer has at least one electric car, and guess what, these cars are not selling well. I live in Canada and the Nissan leaf is available to the Canadian public, but I have yet to see one being driven here in Montreal (or at least parked) myself. It’s either that all these Nissan Leaf owners think of their cars as Maybachs and only want to drive them in “exclusive” areas, or it’s that the Nissan leaf isn’t selling very well. Maybe Tesla will be more lucky in North America, and it’ll sell well, but considering it currently has a market cap of about 50% of that of General Motors’ (or Ford’s, for that matter), I’d say it’s a pretty hard task to meet those stockholders’ expectations. Tesla is a very new car, and the car manufacturing realm is a very competitive one – only time will tell whether this crazy venture will work or not. I personally think that it won’t, unless, of course, the reviews came out great and every other person in North America bought a Tesla and threw his old car. I guess we’ll have to wait and see, but if you’re buying those TSLA stocks as if you are on a shopping spree, then I suggest to cover yourself with some put options, just in case this mad adventure doesn’t work.